Quilter Jacquie Gering shares some advice about the BERNINA Walking Foot #50. Since discovering quilting five years ago, Jacquie has become a passionate quilt maker and designer. She is known for her “out of the box” designs and unique style. She is the co-author of the newly released Quilting Modern: Techniques and Projects for Improvisational Quilts. She blogs and shares her quilting knowledge on her popular blog, Tallgrass Prairie Studio and lives in downtown Chicago with her husband and her black lab, Bruno. What would I do without my Walking Foot #50? For those of us who quilt on our home machines this foot is our quilting partner, and your path to a myriad of creative quilting possibilities. The Walking Foot #50 works for straight-line quilting and the design opportunities with straight lines are limitless. Straight-line quilting is only the beginning; this foot can also help you stitch a variety of quilting designs with curves and even supports quilting with decorative stitches on your machine. It is also my go-to foot for attaching quilt binding. To get the most out of the Walking Foot #50, it’s important to understand how the foot works and how the foot’s design features support you as a quilter. Very simply, this foot adds a second set of feed dogs to move the top fabric at the same rate as the bottom fabric to keep multiple layers from shifting. For quilters, that means that the quilt sandwich moves evenly and prevents bunching or puckering. 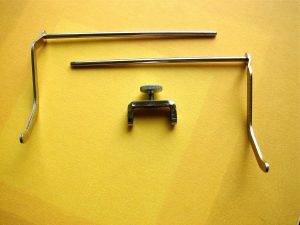 The Walking Foot #50 attaches like a regular foot but with the addition of a u-shaped arm that rests around the needle bar. It’s important that the foot is attached correctly. When the arm is attached correctly it allows for the extra feed dogs to do their work. 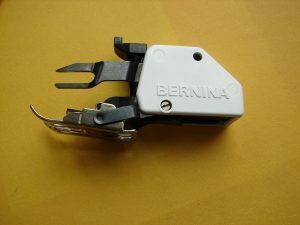 The BERNINA Triple Sole Walking Foot #50 comes with three interchangeable soles. Closed sole – is recommended for sewing on slippery or sticky fabrics and for matching plaids. There are ¼” and 1/8″ markings on the sole to serve as seam and cornering guides. Open sole – is recommended for machine quilting. It has an open toe to improve visibility when quilting. Again it has the ¼” and 1/8″ markings and the back of this sole is designed to reduce drag and as quilter’s know, drag is the enemy when quilting. Center guide sole – this is a new sole that is recommended for helping achieve a perfect stitching line along a seam or edge. Ask your BERNINA Dealer about this one! To change the sole on your foot you’ll need a small flathead screwdriver. Place the foot on its side with the screw on top as shown. Loosen the screw with your screwdriver to open the bars that hold the sole in place. Slip off one sole and place the new sole in position. You’ll notice that one side of the sole has two holes and the other one. Line these up with the holes on each side of the bars and tighten the screw. The sole will seat itself. Changing the sole is pretty simple, but if you have trouble, your friendly BERNINA Dealer is just a phone call away. The Walking Foot #50 also comes with two seam guides, one for the right and one for the left. 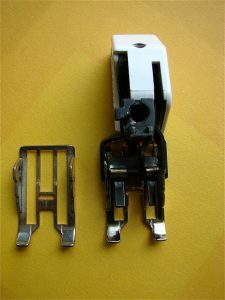 The seam guides attach through a hole at the back of the foot and are secured with a screw. The seam guides allow you to quilt repeating lines an equal distance apart without marking and if we don’t have to spend time marking, that’s more time we can spend quilting! Set the seam guide the desired distance from the needle and tighten the screw in place. Run the guide along the previous line of stitching as you sew. Remember those markings that were referred to on the sole of the foot. Let’s explore those a little more closely. 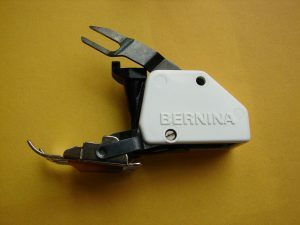 The BERNINA walking foot is perfectly designed to help you achieve straight-line quilting designs easily. 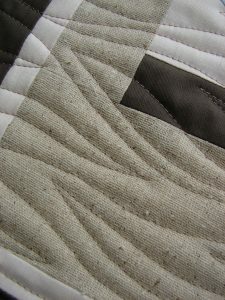 The marks on the foot will help you quilt dense quilting lines. With the needle in the center position, running the edge of the foot along a line will yield lines ½” apart. Again with the needle in the center position, use the ¼” mark on the sole to quilt lines ¼” apart. So, you want to quilt a quilt on your home machine with your Walking Foot #50. What do you need to know to be successful? 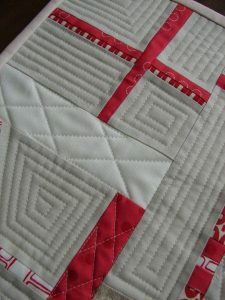 For some basics on how to get started, check out this introduction to straight-line quilting. Quilting with the Walking Foot #50 – endless possibilities! I’ve learned so much about quilting with the walking foot since I started making quilts, and to share that information I’m starting a series on my blog, Tallgrass Prairie Studio, called Walking Foot Wednesdays. I’m going to be sharing hints and tips for quilting with the walking foot including quilting design ideas, and this is just a preview of the series. I hope you’ll come over and join me and get inspired to quilt! You can also learn more about the BERNINA Walking Foot #50 by visiting the BERNINA USA website product page, and by downloading this FREE project featuring this foot, the Walk In The Park quilting project by Nina McVeigh, also from our Quilting Classes page at our BERNINA USA website. Thank you so much. This is good information. Question: How does the walking foot adjust to different stitch lengths or is it set to just one such as 2.5? Hi Kuppy, the walking foot will adjust to the stitch length or width that you set for your stitch. 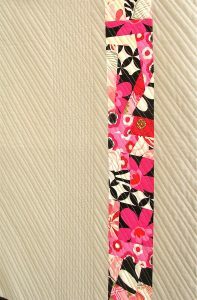 Use it for straight stitch, zig-zag, or decorative stitching. Bernina Edgestitch #10 vs sole with central guide that came with Walking Foot #50. Does anyone know the difference in application between these two feet? I already have the sole with central guide that came with my Walking Foot. Can I do everything with that that I could do with the separate Edgestitch Foot #10? (I am not a quilter) Thank you! 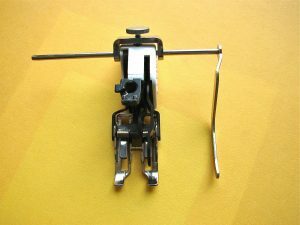 Hi – This is Jo – Edgestitch Foot #10 is one of my favorite presser feet and I use it on nearly every project I stitch. I also have and use Walking Foot #50 with the center guide attached, but I can think of at least three reasons I need both: 1) The “pinch and pull” action of the walking foot isn’t always needed, 2) it’s a big accessory – too big to fit into some of the small spaces I want to stitch, and 3) I like to go FAST, and the walking foot slows me down, so if I don’t need that walking foot action I use Edgestitch Foot #10. And three reasons I’d use Walking Foot #50 rather than Edgestitch Foot #10: 1) Bias binding – making it, attaching it – to prevent slipping, 2) stitch-in-the-ditch quilting (again, to prevent slipping), and 3) stitch-in-the-ditch and edgestitching on “tricky” fabrics that might slip out of position, such as plaids, stripes, knits. Can I use the tripple zig-zag stitch?